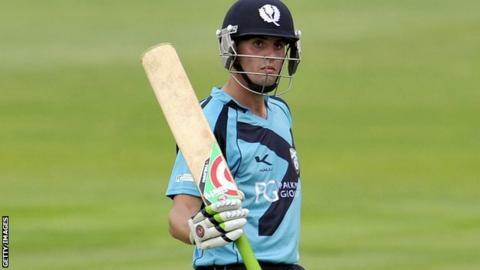 Scotland's Calum MacLeod labelled the remaining World Twenty20 qualifiers as "must-wins" after a "vital" victory over Nepal. MacLeod top scored with 82 not out as they beat Nepal by eight wickets after losing their opening two matches. The Scots face Kenya on Tuesday. "We've got a good history against Kenya," said MacLeod. "We played them five times this year and won all five. "They'll be carrying a bit of baggage, so hopefully we can exploit that." Scotland had already lost to Bermuda and Afghanistan, but chasing a total of 137 for seven against Nepal, they reached 138 for the loss of just two wickets. Captain Kyle Coetzer was also unbeaten on 20, while Matt Machan made 28 from 19 balls. "Yes I think it was vital," MacLeod told BBC Radio Scotland. "Especially after the first two games not going the way we wanted. "In both of the previous games we'd had patches of good cricket but hadn't quite got the game together. Obviously today we put more of a complete performance in and got over the line. "It's quite a close tournament so to win a game where we were pretty much in control for the majority was a good way to get off and running. "Very pleasing to do it [score 82 n.o] in a match-winning game. In the Afghanistan game I played okay but didn't get us over the line. So for it to actually mean something, it was quite pleasing." Scotland are now on two points in Group B with a cluster of countries above them on four points. Six out of 16 teams in the tournament will progress to next year's finals in Bangladesh, with MacLeod still confident the Scots can achieve their aim. "I wouldn't play it down," he said. "It's still our goal and what we came here to do. "The first two defeats weren't helpful but it doesn't change that we're going to go into every game trying to win them."